Stubborn Mule’s Helene Cooper set off to the Galapagos with her nine-year old son for a wildlife extravaganza of a lifetime. Surrounded by the most amazing creatures at every turn, they were utterly entranced. Her son was in seventh heaven, snapping away merrily at absolutely everything and seemed to spot things before even the guide at times. Here is the first of her blogs on holidaying in the Galapagos with kids. 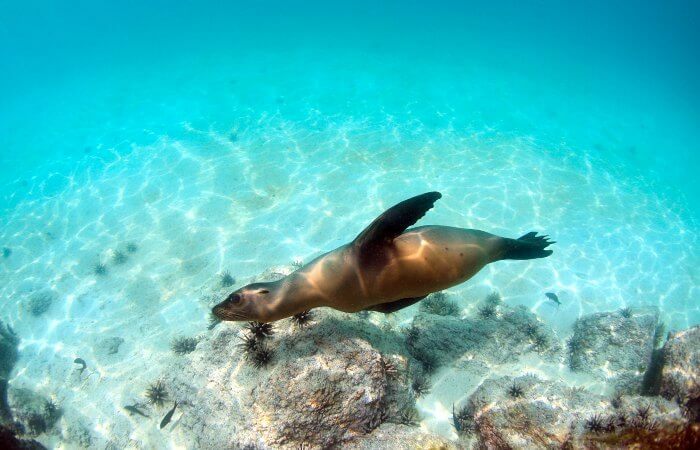 Live the Blue Planet dream in the wildlife paradise that is the Galapagos! Every wildlife-related activity you can think of, you can enjoy in this natural wonderland, sitting on the Equator, just off the coast of South America. But there are a few other memorable experiences you can enjoy here too – if you happen to ever get bored of laughing at Blue-footed Boobies or swimming with sea lions (doubtful….). To tick them all off you would really need to take an 8-day cruise that visited all the necessary islands where these creatures live. But if you can’t manage that, don’t worry – even spotting a handful will still bring you unforgettable wildlife encounters. Without fail you are going to come across an incredible array of birds and mammals in an amazing backdrop of turquoise seas, dramatic volcanic terrain, lush highland scenery and powdery white sandy beaches. Who’s counting anyway….? Get up close and personal with little more than a wetsuit between you and a white-tipped shark or a golden ray. Whether you walk in from the beach or jump in from a panga (zodiac dinghy), you can snorkel alongside these marine creatures in their own environment. And marvel at how agile they are compared to your own lumbering movements. Playing hide and seek with a sea lion, swimming through a shoal of ‘Nemos’ or carefully following a sea turtle as it paddles beneath the waves is a remarkable experience. Not all activities in the Galapagos have to be that active. Perfect for youngsters, non-snorkellers or just people wanting to enjoy the marine life at leisure, these cruises go from either island jetties or your live-aboard ship. You can bob along following the fish, sharks, rays and turtles clearly viewed through the glass beneath without getting a drop of the Pacific on you. Everyone likes a bit of shopping – and children will love choosing which booby t-shirt to purchase. The main Galapagos islands are packed full of souvenir shops (mostly selling the same items at similar prices so don’t waste too much time shopping around) from flip-flop bottle openers to Lonesome George neck rests. All somewhat overpriced but hey, you’ll probably only be there once. Don’t forget to visit the chocolate shop in Puerto Ayora where you can enjoy a demonstration on how it is made on Santa Cruz and then stock up on some bars afterwards. No, we are not back on mainland Ecuador. The Galapagos are full of volcanoes and on Isabela Island there is the opportunity to summit Sierra Negra (1,124m). This is a 5-6 hours round trip (you can even choose the easy option and take a horse partway but we think that’s cheating…) and offers stupendous views of the second largest caldera in the world as well as active thermal vents, lava fields and other volcanoes on the island. … ours took three months! A brilliant way to introduce responsible tourism to children, the centre offers an enjoyable way of learning about conservation, evolution and survival along a series of open air boardwalks and is a breeding centre for the Giant Tortoise (so you can see babies as well as fully grown beasts). It is also home to the (now stuffed) body of Lonesome George, the last of his species who died in our lifetime and thus a constant reminder of the threat of extinction. Gently paddling along the rocky coastline, looking up at a blue-footed booby clinging to a cliff, or down at a sea turtle swimming alongside – or even across at a sperm whale breaching the waters nearby, has to be one of life’s most peaceful and memorable moments. Top tip – don’t paddle too fast and rest often, the lack of splashing will bring marine life closer. Possibly the most fun you can have on the road going nowhere fast. Everything stops when a Giant Tortoise lumbers into sight. Buses are forced into ditches to get past, cars screech to a halt and motorbikes swerve to avoid them. These magnificent beasts definitely take priority (and hitting one incurs a massive fine). Fortunately they do not usually meander at night and drivers are well used to their presence but the regular sight of shells lined up along the roadside ready to traverse a main highway still takes some getting used to. Now why did the Giant Tortoise cross the road….? For the low down on exploring the Galapagos with kids, see our Galapagos family holiday section, Helene’s blog on a typical day on a Galapagos island cruise ship and our example Ecuador & Galapagos itinerary. Check out the best time to go to the Galapagos Islands or simply get in touch with Helene by phone or email. We’d love to hear about your experiences holidaying in the Galapagos with kids, so do send us your reviews and opinions. Thank you – info@stubbornmuletravel.com.